How to become a Professional Knitter - Robin Hunter Designs: What is Standard Sizing? 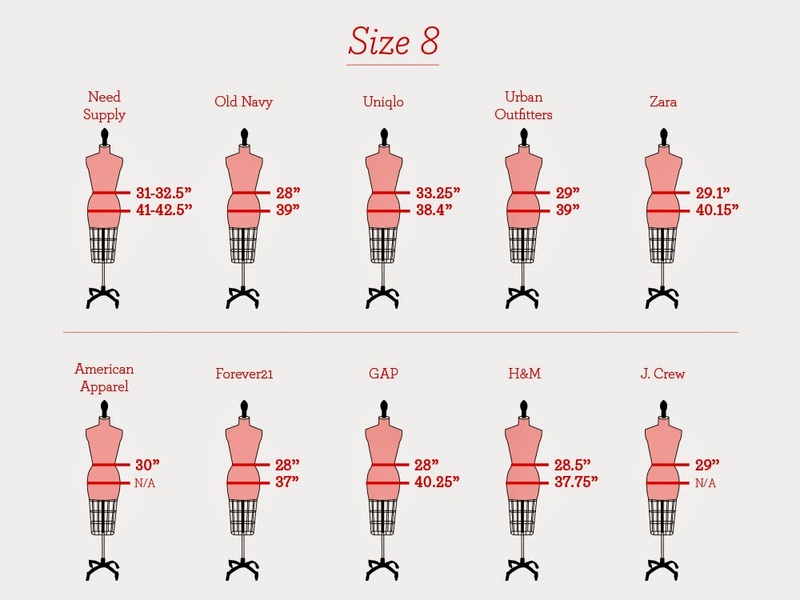 There is a great article here comparing retail sizes across 25 mainstream retailers. The article compares the measurements at waist and hip for a size eight jean at 25 different retailers to find out what an actual size eight should be, and who the worst offenders are when it comes to irregular sizing. A week ago I bought some new summer tops. I bought them all in the same store. I ended up with a mix of tops labelled as both small and large. I started by taking small and medium sizes into the change room. I had to go back out to the racks to exchange two of the styles for size large and none of the mediums fit me? For comparison, I would normally buy a size 6 petite oxford shirt at Brooks Brothers or a size 6 petite blouse at Ann Taylor. These differences all reflect so called standard measurements. The standards are specific to specific sources, they are not standards that apply to all bodies. This is why it is so important to compare your measurements to those of any pattern and to make the necessary adjustments for good fit. Labels: fit, knitting blog, sizes, What is Standard Sizing?